Mena Travel Agency had moved from Cuba to Miami in 1961, marketing to a local, largely Cuban-American community already familiar with the brand. But in 2013, the family-run business faced a dwindling aging customer base, and recognized the need to appeal to a younger, broader demographic. VSBrooks Advertising and their digital division, InspiraD3, were initially tapped to update Mena Travel Agency’s website, which was aesthetically unappealing, difficult to navigate and redundant in content. 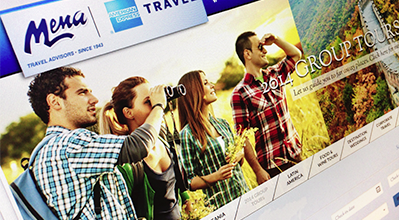 For the site to be a success, we needed to build awareness and educate the younger Internet-savvy, English-preferred and acculturated Hispanic traveler, (geo-targeted within a 20-mile radius of the agency) on the benefits, ease and value of using a travel agent, generate calls and direct traffic to website via social media engagement, E-blasts and display digital advertising. After completing VSBrooks’ Brand Retreat, the agency’s logo was refreshed as Mena Travel Advisors, to more accurately reflect their services. The centerpiece needed to be the recreation of Mena’s website to be graphically appealing, dynamically responsive and SEO friendly, placing the latest travel packages on its front page. The site also had to allow for easy search and facilitate agency input via a robust content management system. • 49% were on the site from 1 to 10 minutes, taking deeper dives into the website. The analytics also showed that traffic spikes during this period were due to the display ads, e-blasts and social media postings, driving home to the Mena’s the importance of having a strategic and targeted approach to their social media and digital display campaigns.